The Makabayang Koalisyon ng Mamamayan (MAKABAYAN) officially endorsed its bets for the upcoming 2019 midterm polls in its proclamation rally held at the Quezon City Sports Club on Sunday morning, March 3. 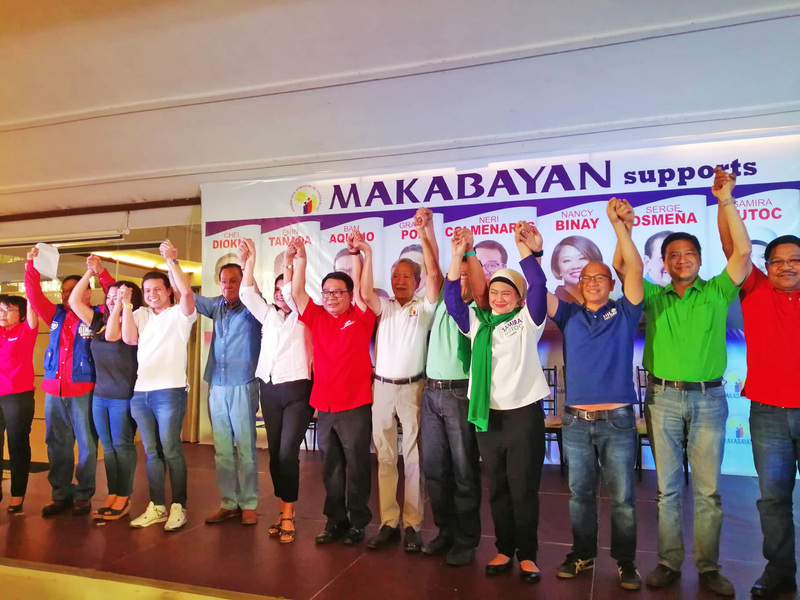 Along with Makabayan sole bet Neri Colmenares, the progressive coalition endorsed independent re-electionist Senator Grace Poe represented by son Brian Poe Llamanzares, opposition Senator Nancy Binay represented by Atty. Danton Lucinario, and Senator Bam Aquino represented by wife Timi Aquino, former congressman Erin Tañada, former senator Serge Osmeña, and newcomers Atty. Chel Diokno, Atty. Florin Hilbay, and Samira Gutoc. Makabayan president Satur Ocampo manifested the importance of championing the senatoriables that would not be afraid to push for a pro-people Senate. “In these times of escalating efforts to stifle dissent and a rising threat of dictatorship, where impunity reigns and the system of checks and balances among the Executive, Judiciary and Legislative branches of government is in peril, we need an independent Senate. The upcoming elections gives us the opportunity to elect to the Senate men and women of proven competence and integrity who can assert the Senate’s independence and push for laws that favor our people. Candidates who have a proven track record of public service and a fighting chance to win.” Makabayan said in their statement. “Napakalakas ng administrasyon, pero ito ang masasabi natin: ngayon ang taumbayan ay nagtatanong beyond political parties, beyond promises. Tumitingin sa track record at posisyon ng mga kandidato sa isyu. Kaya napakalaki ng chance ng mga independienteng kandidato dahil ang administrasyon hindi kayang sagutin ang tanong at issue ng mga mamamayan.” said Neri Colmenares, the sole bet of Makabayan. The progressive coalition is hopeful to work with the nine candidates especially in pushing for the repeal of the TRAIN Law, campaigning of the opposition to the current Charter Change, standing up for the sovereignty of the Philippines, upholding of human rights and due process, as well as pushing for the resumption of peace talks between the Government of the Republic of the Philippines (GRP) and the National Democratic Front of the Philippines (NDFP).